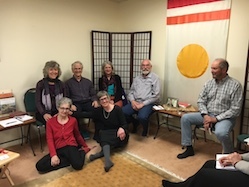 (2016) The Shambhala Working Group on Aging ~ The purpose of this project is to create the Aging Hub, an accessible, relevant and easy-to-sustain website for Shambhalians. News and current information in a “timely format” (it will not actually be a blog). A feed of articles in The Shambhala Times related to the topic of aging. We would work with the Editors to formalize explicit criteria for the use of the “aging-in-enlightened-society” tag. The recent article by Larry Barnett on “Crossing into new Territory” is a good example of a relevant article that is not tagged correctly. When articles are tagged correctly they would appear automatically on the Aging Hub. (As a separate effort, the Working Group on Aging will be making an effort to get regular articles and announcements in the Shambhala Times.) We will investigate whether a similar feed from Shambhala Online could automatically reference relevant videos or events.